On Monday, June 12th students in the Welding and Metal Fabrication program visited Lehigh Heavy Forge. The Forge was previously a part of Bethlehem Steel. Students had the opportunity to witness a 10,000 ton Hydraulic press forging red hot ingots and they toured the large machine shop which finishes the forgings to drawing requirements. Products being made included many large but precise parts for industrial and military applications. 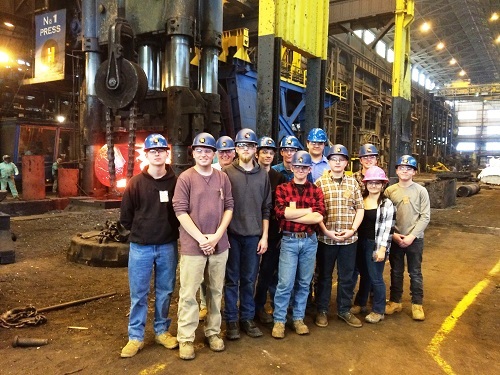 The trip was the fourth field trip for the year for Welding students who previously visited High Steel in Lancaster PA (which produced half the structural steel for the new Tappan Zee bridge), Philly Ship (which builds up to 900 ft commercial ships), and E.I.I. Electric where students welded aluminum used for 500,000 volt substation bus bars.